AEB PR — The space cooperation between Brazil and Ukraine has taken another important step. It was extremely productive meeting held on Tuesday, September 13, 2011, the Brazilian Space Agency (AEB) between, headed by its chairman, Marco Antonio Raupp, delegation visits and SDO Yuzhnoye Company of Ukraine, led by its director general, Alexander Degtyarev. The meeting was attended by representatives of the Institute of Aeronautics and Space Department of Aerospace Science and Technology (DCTA), the Secretariat of Strategic Affairs (SAE) and Alcântara Cyclone Space Company (ACS). The meeting continued the understandings started during the visit of Brazilian technical committee, headed by the President of AEB, in early July, the Ukrainian industries involved in the program of bi-national company ACS, which will promote launches of Cyclone-4 rocket, Ukraine from the center of Alcantara, Brazil, introducing a safe and economical alternative in the global market for commercial launches. We discussed the various possibilities of expanding cooperation between the Brazilian space institutions, coordinated by the AEB, and the Ukrainian space industry – in particular, SDO Yuzhnoye company with over 50 years of uninterrupted existence and enviable experience in various sectors of space activities, both launch vehicles and their basic systems such as satellites in different types and purposes. They clear the great opportunities of cooperation existing in all these spheres. The joint development of satellites, including those equipped with radar, will be object of special attention. It was agreed to prepare a training plan for Brazilian technicians in basic systems and equipment for launchers, as well as fuel security. The amount of training of human resources should involve Ukrainian and Brazilian universities, and experts linked to the Ministry of Science, Technology and Innovation, Defence and Communications. Dmitriy Pozdnyakova, international relations secretary of Yuzhnoye, presented several projects of the company, which since 1954 has released more than 400 spaceships. For the future, the company plans the development of innovative projects such as launching of ships to protect Earth from asteroids. Paulo Moraes Jr., Department of Aerospace Science and Technology of the Ministry of Defence (DCTA), presented a history of 50 years of the Brazilian project, who made three unsuccessful attempts to launch. The last was in 2003, when a fault in the fuel caused an explosion that killed 21 civilian technicians. He also spoke of the future program “Southern Cross”. Five vehicles will be designed in reference to the five stars of the constellation known. The first rocket to be launched in 2015 and the second is scheduled for 2020. Unlike the previous rockets, solid propulsion, the project also will include liquid propulsion. This design space can contribute to the development of society, said: “We are all dependent on satellites and rockets accordingly,” he says. A new course for the Brazilian space program is being designed in partnership with Ukraine, a country with extensive experience in the industry. The proposal is part of UNB with a Masters in Aerospace Engineering will form frames for the binational company Alcantara Cyclone Space (ACS), headquartered in Brasilia. Teachers, masters, representatives of the company and the Ukrainian government to discuss the future of the project in Ukraine-Brazil Seminar: Opportunities for the Scientific-Technical Cooperation in Space, held on Monday 12 in the Auditorium of the Rectory. 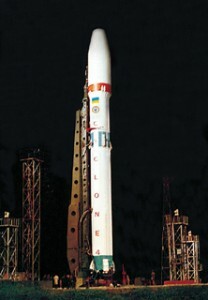 The goal of the partnership is the exchange of technologies and will culminate with the launch of Cyclone-4 rocket, scheduled for 2013. Later this year, the ten students in master’s degree in Aerospace Engineering from UNB will spend six months in Ukraine, where they will have contact with the Cyclone-4, developed entirely by the Ukrainians, and will be trained to work at ACS. Students will be received at Dnipropetrovsk University and return to Brazil to complete a master’s degree. The project costs U.S. $ 487 million and is funded by both countries, half and half. The ACS will coordinate the preparation and launching of the rocket in 2013 from the Alcantara Launch Center, in Maranhão, and will have experts from both countries. Speaking at the seminar, the rector José Geraldo de Sousa Junior recalled that UNB is consolidating new areas of research. “This will be the basis for future aerospace engineering graduate,” he said. The idea is to build a space center in Brasilia to house about 100 scientists on the campus of UNB range, an initiative supported by the two entities based in the city area, the ACS and the Brazilian Space Agency (AEB). The convergence between the two countries dates back to 2006 when ACS was created. In early 2009, Ukraine sought UnB to treat the creation of the master. Once you know the projects of the European country, Carlos Alberto Gurgel Veras, head of the Department of Mechanical Engineering at UNB, was impressed with the technological state of Ukraine. “It’s a unique opportunity to start this partnership,” he said. According Gurgel, after forming the first ten engineers, the Aerospace Engineering course will enable future members of the Brazilian space program.